As well...or perhaps even better...MAKE PEACE! 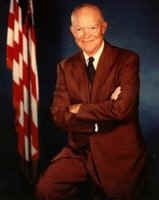 Dwight D. Eisenhower served as General and President of the United States when I was growing up. He always personified a compassion and fairness to me. Listen to his words as he gave a farewell message to the Nation. From Wikipedia I learned that he not only served in WWII, but as a Lieutenant in WWI! There is also a Bio on him on the White House page. Dwight David "Ike" Eisenhower, October 14, 1890 – March 28, 1969) was a five-star general in the United States Army and the 34th President of the United States, from 1953 until 1961. During the Second World War, he served as Supreme Commander of the Allied forces in Europe, with responsibility for planning and supervising the successful invasion of France and Germany in 1944–45. In 1951, he became the first supreme commander of NATO. As President, he oversaw the cease-fire of the Korean War, maintained pressure on the Soviet Union during the Cold War, made nuclear weapons a higher defense priority, launched the Space Race, enlarged the Social Security program, and began the Interstate Highway System. He was the last World War I veteran to serve as U.S. president, and the last president born in the 19th century. 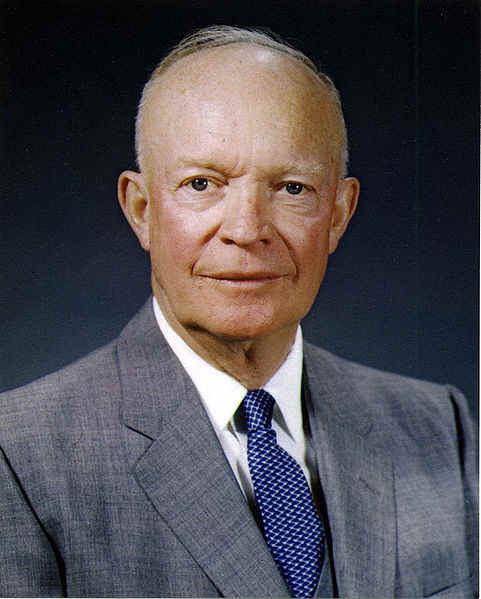 Eisenhower ranks highly among former U.S. presidents in terms of approval rating. He was also the first term-limited president in accordance with the 22nd amendment. In 1915, at Fort Sam Houston, Mamie met Dwight D. Eisenhower, a young second lieutenant on his first tour of duty. She drew his attention instantly, he recalled: "a vivacious and attractive girl, smaller than average, saucy in the look about her face and in her whole attitude." On St. Valentine's Day in 1916 he gave her a miniature of his West Point class ring to seal a formal engagement; they were married at the Doud home in Denver on July 1. On June 12, 2011, I learned something I didn't know about Ike. I had a lapse of common sense to think that any politician can be truly honorable in their actions in a world dictated by the almighty dollar, franc, deutchmark, or whatever name it's given. I learned that he campaigned on newly emerging television programming under the tutelage of the famous Ad Man; Rosser Reeves. Ike was made to remove his eyeglasses to appear more...what?! !...and given scripts of answers to supposed questions the public would ask, and unsuspecting citizens recruited off the streets to be dubbed in after reading scripts of questions given them. The finished product made it seem that people were in conversation with the General, and that he off the top of his head was replying very eloquently and wisely. I don't doubt his intelligence, but I am now questioning his Integrity. Intelligence becomes manipulation without Integrity. I learned that the war in "Banana Land," promoted as a civil war, was a construct of Ike's government, as he and others had vested interests there. I do not, however, believe in any benefit of war. I believe that if humanity will learn to cultivate peace and compassion in each individual...there is the foundation and manifestation of peace. There is so much that Earth and God/dess give...there is abundance...why must the human act from greed; grabbing, conquering...implimenting subversive plans and actions? I don't have the answer as to how humanity can accomplish all it does without some being the Leaders...I do know that the quality of those Leaders needs to change...they need to be PARTNERS of the People! And ALL the People need to Serve LIFE, and make decisions that benefit ALL people, ALL lifeforms, and the ENTIRE Planet...AND... the entire Universe. We cannot think that dumping garbage into space will be of any benefit to the balance...We need to begin thinking, planning and acting SUSTAINABLY. 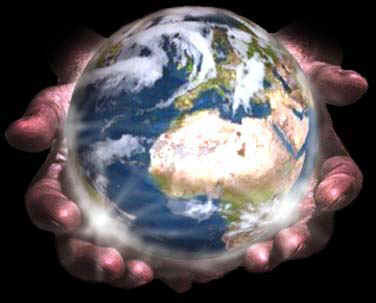 She's in your hands, and in our Leaders' hands. Pay attention to what you and your leaders are doing...for the Earth is truly your Home...and what you do to the web of Life, you do to yourself...wealthy powerful people may enjoy the best of it now, but when all is destroyed, they shall be the last gasping the last painful breaths!